Dem LGB 20225 Allegra Triebzug liegt ein Bogen mit Warnschildern (Pictogrammen) bei die man zur Erhöhung des vorbildlichen Aussehens auf die Dachpartie aufkleben sollte. Eine 12-seitige pdf Datei, angeboten zum Download unten rechts unter "Weitere Dokumentation", erster Download, enthält 12 Bilder auf denen die korrekte Position der Warnschilder zu sehen ist. 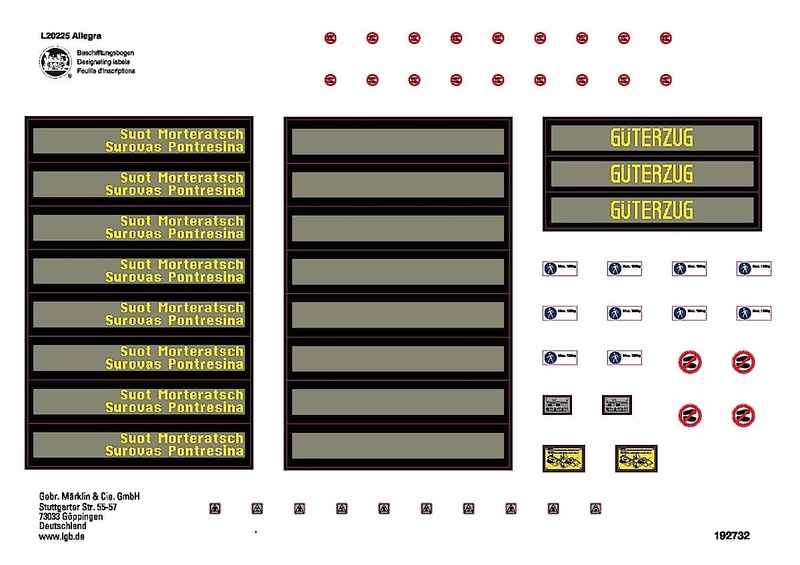 Im zweiten Download unter "Weitere Dokumentation" findet man eine pdf Datei des Stickerbogens in hoher Auflösung. Power 1 Vorn - An diesem vorderen Kopfende gibt es keine Pictos, auch keine "Betreten Verboten", nur an der Seite am Lüftungsgitter "Vorsicht heiß"
Power 3 Hinten - An den Lüftungsgittern kommen Warnsymbole "Vorsicht heiß", die so aussehen wie Blitz-Zeichen. Diese kommen auch gegenüber auf der anderen Seite hin. Power 4 Hinten - An diesem Kopfende gibt es keine Piktos, auch keine "Betreten Verboten", nur an der Seite am Lüftungsgitter "Vorsicht heiß"
The LGB 20225 Allegra 3-unit rail set comes with a sheet of warning symbols (pictograms) which one should apply to the roof sections to improve the prototypical appearance. A 12-page pdf file is available for download at the bottom right under "Additional Documentation", first download, this document contains 12 images which show the correct position of the warning symbols. The second download is a high resolution pdf documentof the sticker sheet. Power 1 Front - At the powered head end there are no Pictograms , no "Betreten verboten (entry prohibited)", only on the side at the air ventilation grill "Vorsicht heiß (caution hot)"
Power 2 Front - On top of the air intake grilles there should also be two stickers diagonally, "Vorsicht heiß (caution hot)", but since there are not enough of those we just use two for each side of the unit. Middle 1 - This box requires two stickers on the facing surface. Power 3 Rear - At the air ventilation grills there are warning symbols "Vorsicht heiß (caution hot)", that look like lightning symbols. These are required on the other side as well. Power 4 Rear - At the front of the rear there are no Pictograms , no "Betreten verboten (entry prohibited)", only on the side at the air ventilation grill "Vorsicht heiß (caution hot)"